Austrian mathematician; born at Mährisch-Schönberg Dec. 31, 1831. The son of very poor parents, he had to earn a livelihood even as a mere boy. In 1858 he graduated from the Polytechnic Institute in Vienna, at which institution he became assistant in the following year. In 1866 he passed the state board examination as teacher of geometry, and was employed in the schools of the Austrian capital. In 1870 he was called to the forestry academy at Marienbrunn, where he became professor of geometry; in 1875 he was appointed in a similar capacity at the agricultural academy at Vienna; and in 1891 he was sent as representative of Vienna to the Austrian Reichsrath. 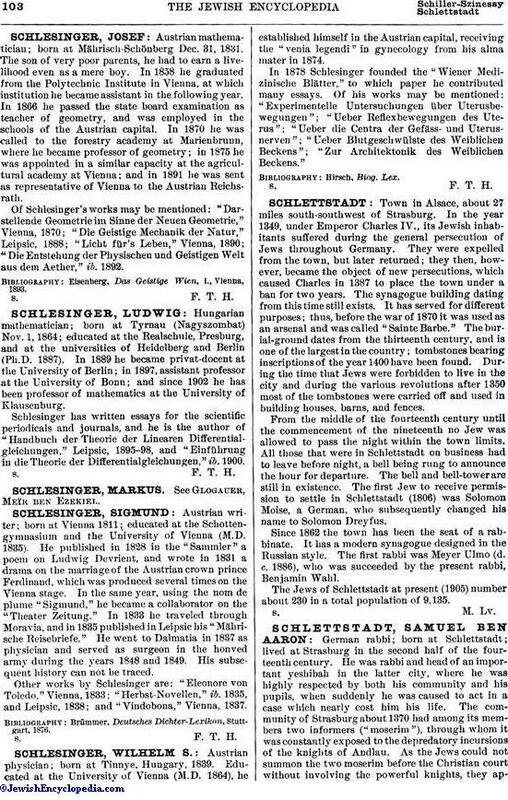 Of Schlesinger's works may be mentioned: "Darstellende Geometrie im Sinne der Neuen Geometrie," Vienna, 1870; "Die Geistige Mechanik der Natur," Leipsic, 1888; "Licht für's Leben," Vienna, 1890; "Die Entstehung der Physischen und Geistigen Welt aus dem Aether," ib. 1892. Eisenberg, Das Geistige Wien, i., Vienna, 1893.